Super nice hostel with relaxed atmosphere. Hostel was clean , the breakfast was great and the pool ehm.. looked clean but too cold for the time of the year I was there. Close to the bus stop to the waterfalls. Very spacious dorms and you can practically dance in the shower! Bus stop to both sides of the Falls is just around the corner. Staff is very helpful with explaining how to get to the Falls and offer tours themselves. Nice patio with a bar and pool. I did miss some juice or milk at breakfast, they only serve tea and coffee. Had a nice stay overhere. The staff was very friendly and close to the waterfalls! 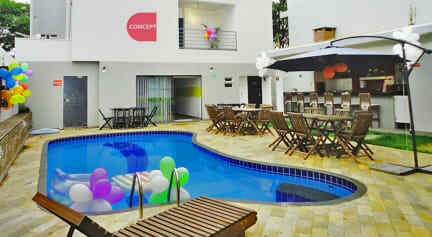 Nice swimming pool and great/comfortable beds!